With a diverse curriculum, pre-kindergarten through eighth grade students at Holy Name School get the challenges they need, through a variety of teaching techniques, to learn and grow. We combine both traditional and contemporary approaches to teaching to sharpen each student's critical thinking, creative thinking, and problem solving skills. A new educational dimension to parish life began in the late 1950s with an appeal letter to parishioners from Pastor William H. Harrington announcing the ambitious goal of creating the Holy Name School. This goal was to be accomplished by offering memorial opportunities to subscribers, who through their generosity, would cover content costs ranging from teachers’ desks to individual classrooms. This initial effort and other creative fundraising by the entire parish community soon bore fruit, and the cornerstone of Holy Name School was blessed in 1959. Construction of the projected eight classroom structure was underway by September of that same year. The school was designed by the prestigious, church-oriented, architectural firm of Maginnis, Walsh, and Kennedy of Boston, perhaps best known for the design of the National Shrine of the Immaculate Conception, Washington, D. C. The structure was built on the site of the original church on Read Street that was then being used as the parish hall and the extensive playground located adjacent to the site. Staffing arrangements were made by the Holy Union Sisters (Sisters of the Holy Union of the Sacred Hearts). On September 3, 1960, the sisters began teaching kindergarten and pre-primary classes to children who were enrolled during a special registration. These sisters succeeded the Trinitarians (Missionary Servants of the Most Blessed Trinity), who for six years previous had conducted nursery classes and done catechetical work at the church and hall. The Trinitarians were prepared to move on, according to their mission, now that a permanent school was in place. Bishop James L. Connolly dedicated and blessed the new $400,000 elementary school on October 3, 1960. He declared that this was a very special day, for “it is indisputable that our Catholic school system does very fine work—intellectually, in discipline, and in character formation.” On this occasion it was also announced that additional grades would be opened each year until eight grades were in place; this evolutionary process was fulfilled admirably. In a joyful golden anniversary school reunion held in 2010, many of our former students and staff returned to share memories and renew old friendships. Most notably, and pleasing to all, is the Parish Center addition blessed by Bishop Sean P. O’Malley back in 1998, which has served to better connect parishioners to their Catholic elementary school. We are proud of our graduates and their subsequent accomplishments in high school. 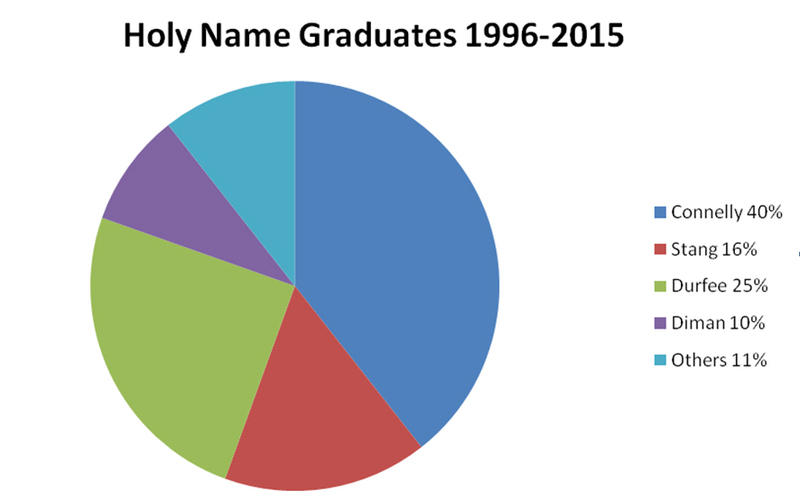 Over the last twenty years, 58% of our graduates went on to a Catholic high school. The chart below shows the distribution of students to specific schools. So, how have they done after graduating from Holy Name School? Twenty-seven students graduated in the Holy Name School class of 2011, and their high school achievements speak for themselves. Your student too, can go on to achieve these awards and many more equipped with the excellent academic preparation that Holy Name School provides. Pre-K: Full-day students begin at 8:00 a.m., and dismissal is at 2:20 p.m. Dismissal for half-day students is at 11:30 a.m. Dismissal on half-days is at 11:30 a.m. 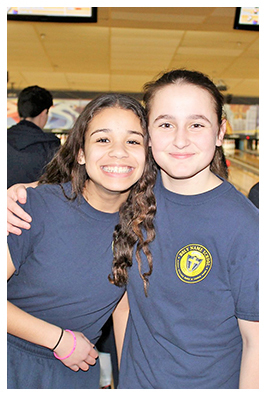 Learn more about Holy Name School. We would love to hear from you.